A literal translation of ‘Maasina Battalu Petti’ would be ‘Laundry case or box’. According to my paternal grandmother, Jwala Rao, these cases have been around in everyone’s homes since she was born which was in 1939. An apt analogy she used was that just as everyone had cupboards and almirahs in their homes, having laundry cases like these were just as mainstream. This particular teakwood laundry case was something my grandparents bought as a newly married couple from a local exhibition held by artisans and Andhra tradesmen. It was a need they could afford and they used it from February 1960 till December 2002 when her son (my father), Shyam Kokku brought it to Hyderabad. 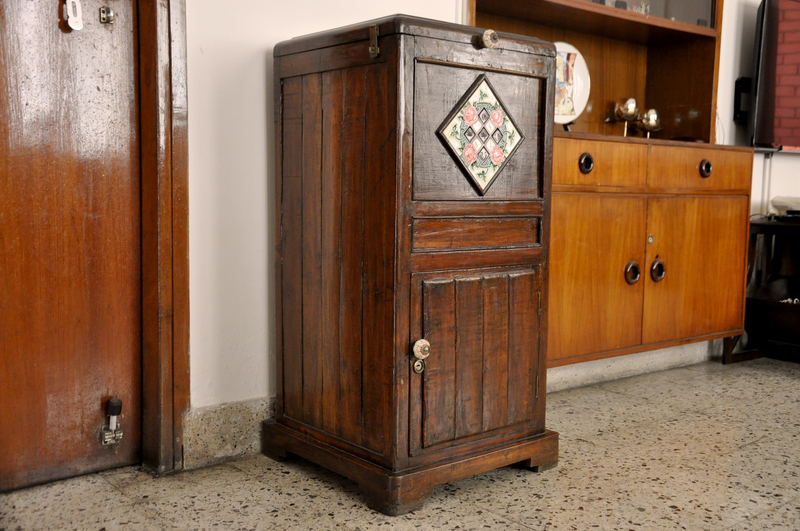 This 3ft tall 1.5ft wide, deep brown teak laundry case was what Jwala calls “pretty standard” in that it had an inlet to put in you soiled clothes, a deep cavity to hold them and a tiny door at the bottom to remove the soiled clothes. 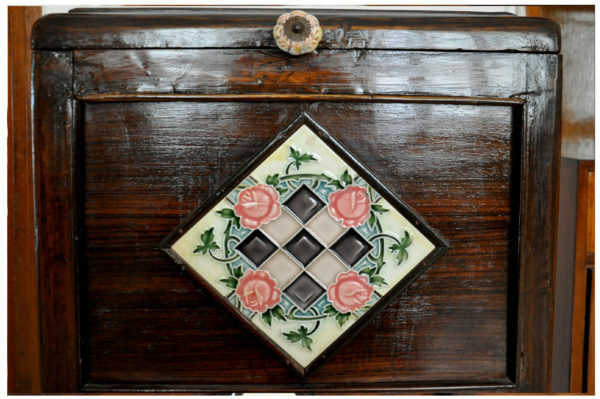 It was ‘sasta aur tikau’, it did not need much maintenance and served its purpose just fine as a case to store soiled clothes. This case was just another piece of furniture in my grandparents’ bedroom. 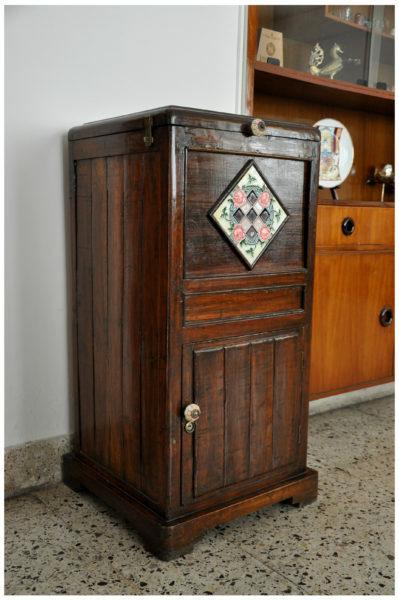 Back in the day, and even now in some houses, says Jwala, you’d lift the lid open from the top and dump in your soiled clothes from the day. Once a week the local dhobi would come around and open the door to the bottom shelf and take your laundry for the week. He would then wash them by the Tungabadra river, dry them on its banks and bring the clothes back home and iron them for an extra charge. 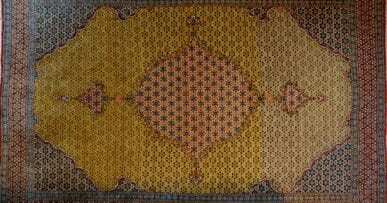 This was common practice for a long time and still is in a few households in Kurnool. 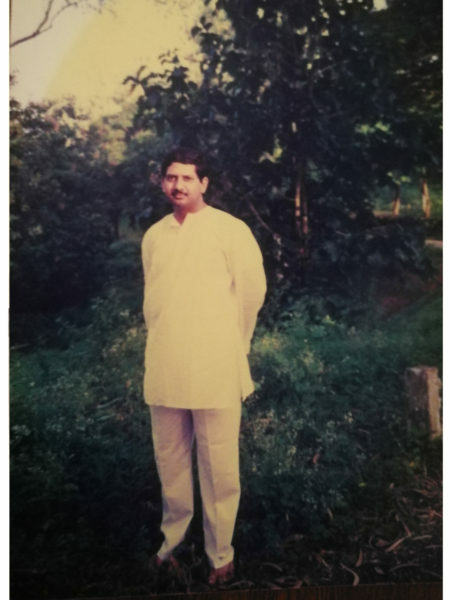 Then there came a time when dhobis were pretty much replaced with washing machines and Jwala was keen to get rid of yet another piece of furniture in an apartment. So Shyam brought this back to Hyderabad with the idea to convert it into a liquor cabinet. It made sense, the wood was great and slowly becoming more difficult to come by. The laundry case wasn’t being used anymore with the advent and convenience of the washing machine. 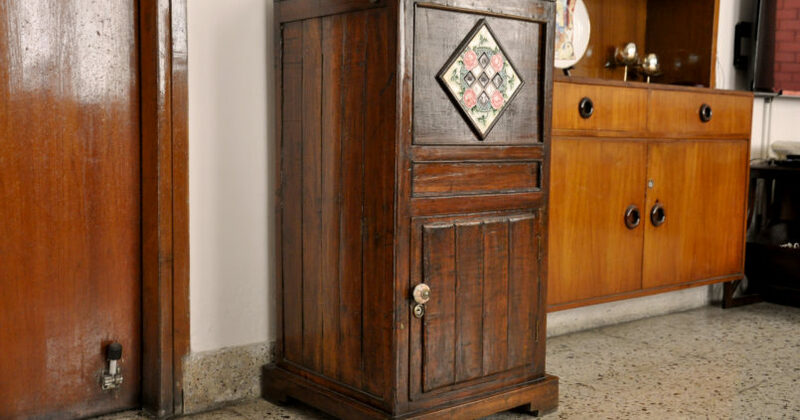 After some discussion about the design and look of this bar cabinet, my mum, Mala Shyam, then visited Gupta Antique store in Banjara Hills, Hyderabad in 2003. In the process of restoring and renovating this laundry case into a liquor cabinet, my parents had three fabulous ideas for elegant changes. One was to replace the top lid with glass, to serve as a cheeky sneak peek in to the liquors it held. The second was that they compartmentalised the case in to two storeys, the top to hold hard liquor bottles of all sizes and the storey below was converted in to a wine case. 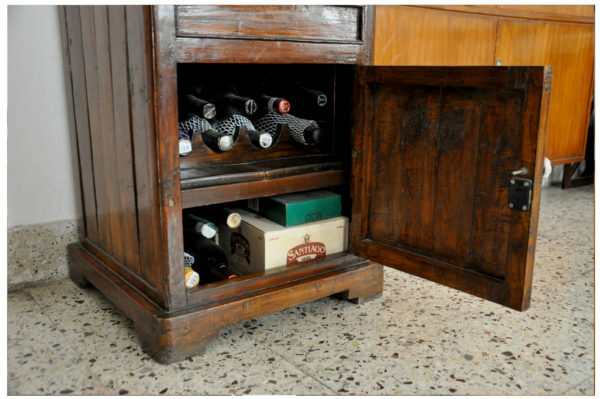 The spare teakwood from the top lid was used to create crates to hold the wine bottles below. 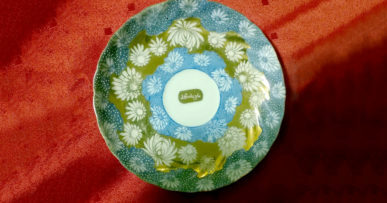 The third and only aesthetic change was that Mala managed to find a lovely enamel tile to bring the design together on the front of the cabinet complimenting any ethnic looking living room’s decor. Since then, this has moved from Hyderabad to Bangalore, with us moving homes. 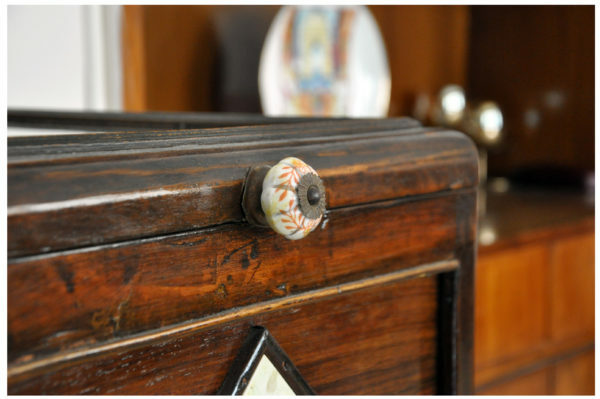 Aside from being very proud to see first hand examples of keeping and re-using old pieces of furniture, it strikes me as poetic and exemplary that something that was a ‘need’ in 1960s has been restored and renovated in to being something that is now considered a ‘luxury’ in most homes. 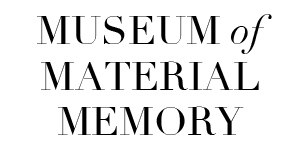 Goes to show that a little thought, some creativity and a lots of heart can change the way we view the importance of material memories. 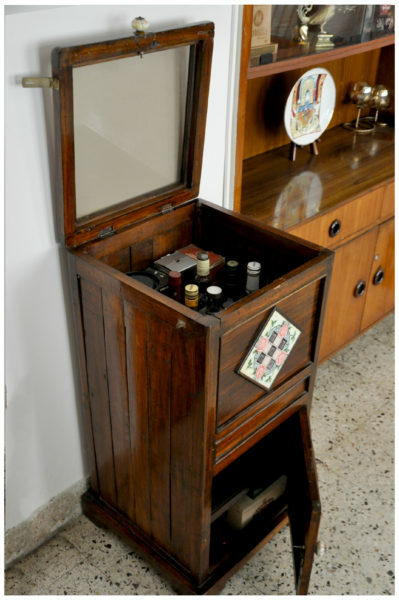 The Laundry case, now a Liquor cabinet, sits pretty in the living room of our apartment in Bangalore boasting of memories of years gone by and liquors collected from various travels. 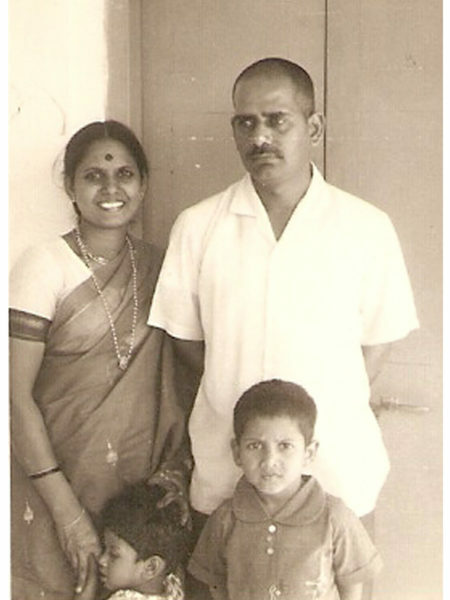 Vittal & Jwala Rao as new parents in the 70s. 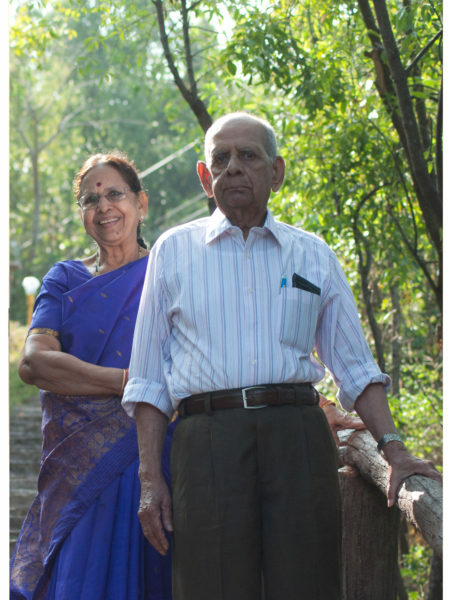 Shyam is standing near his father. Who needs a Meat Shelf anymore?